Overview - FifthWhen Cinderella's cruel stepmother prevents her from attending the Royal Ball, she gets some unexpected help from the lovable mice Gus and Jaq, and from her Fairy Godmother. A beautiful woman and a dashing prince waltz together under a moonlit sky. As the pair extol their storybook love through wistful melody, their movements flow gracefully across the screen, bathed in a dreamy swirl of lavender hues. Her gown sparkles like the stars overhead, infinitely shimmering in the waters below. Their romance is sealed with a gentle kiss, but the hour is getting late… It's a magical scene, beautifully realized through gorgeous animation, stirring emotion, and charming simplicity. Basically, it's quintessential Disney. Even after sixty two years, 'Cinderella' remains an indelible classic of family storytelling, providing entertainment for the young and young at heart. A tale about pumpkin carriages, fairy godmothers, seamstress mice, and glass slippers, it's images are iconic and its simple story is ageless. Based on the classic fairy tale, the film follows Cinderella (Ilene Woods), a sweet young woman who is subjected to the cruel abuse of her evil stepmother and stepsisters. Reduced to nothing more than a maid, the poor girl is forced to clean up after the heartless trio. When all the women are invited to meet the Prince at a lavish ball, Cinderella is forced to stay behind -- but a visit from her Fairy Godmother might change everything. With her dreams now closer than ever before, the fate of her happiness will rest within the sole of a glass slipper -- but will the shoe fit? Arguably one of Disney's simplest films, the movie presents a rather straightforward but endearing tale about dreamers and love. In this storybook world, good and evil are clearly defined, inner compassion begets outward beauty, and cruelty engenders ugliness. Birds literally wake the gentle Cinderella from her slumber while her mean-spirited stepsisters could make livestock screech from the mere sound of their shrill voices. It's uncomplicated allegory at its purest. Simplistic but engaging, the plot skims by with a breezy pace, and while the filmmakers pad out the runtime with some cat and mouse antics, the main narrative is actually remarkably thin. Still, this minimalism is actually part of the movie's appeal and is perfectly suited for its intended young audience without ever talking down to them. The filmmakers' heartfelt approach is full of the studio's trademark personality, and while uncomplicated, it isn't dumbed down. There's a reason this version of the story remains so popular, and somehow Disney cuts right to the essence of the fairy tale, translating all the necessary parts while adding just the right amount of originality. As two dimensional and black and white as the movie's characters and morality can be, the filmmakers manage to layer the narrative with rich visuals, charm, and lovely music, breathing spectacular color and dimension into the proceedings. The animation is wonderfully realized, and the straightforward character designs all evoke a strong sense of individuality. From the sweet and innocent Cinderella sparkling in radiant light, to the chilling evil stepmother cast in gloomy shadow, each member of the cartoon cast feels distinct and alive. The animators also do a great job of blending extended bits of physical humor with more graceful portrayals of romance and love. Classic visual gags give the runtime a fun sense of humor, and more stylized sequences (like the aforementioned dance under the stars) carry an almost ethereal beauty. The supporting cast of mice are also particularly amusing, and while their antics can feel a tad superfluous, the amount of personality the filmmakers are able to evoke through their silly and heartwarming facial expressions is quite mesmerizing. It's not all purely fun and games, however, and one scene involving Jaques and Gus frantically trying to drag a key up a massive staircase is genuinely thrilling, revealing the animators' expert sense of pace and suspense. 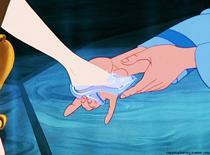 Likewise, despite the animation's classic romanticism, Cinderella's plight is actually genuinely distressing to watch. In fact, though very brief, the scene where her stepsisters tear her dress apart is quite disturbing for a children's film. As gorgeous as the animation can be, the film does feature a rather heavy use of rotoscoping (the human characters were filmed as live action first and then traced over). While this is a perfectly acceptable technique, and 'Cinderella' is far from the only Disney film to feature it, the practice can lead to a slightly hollow quality in certain movements and facial expressions. Still, the artistry on display here extends far beyond mere "tracing," and the animators use the live action frames merely as a reference point to elaborate and expand upon. Memorable and incessantly hummable, the movie's famous songs are filled with whimsy and delight. Playful lyrics about dreams, love, and magic incantations all evoke the innocence of youth while stirring the imagination. Lilting melodies bolster the words, carrying them over soaring notes that are sure to put a smile on even the most cynical of faces. Ilene Woods' elegant vocals radiate with delicate compassion and regal majesty, bringing the songs to life with sincerity and soul. Not just a pleasant diversion, the music is organically blended into the narrative, becoming a natural part of the film's storytelling, and if nothing else, the movie is famous for introducing some of the most memorable lines of musical gibberish this side of "supercalifragilisticexpialidocious." "Bibbidi-Bobbidi-Boo." To a jaded adult like me, it's just silly nonsense -- but when the lights come down and the film starts, those words take on new meaning. Well, old meaning actually. A meaning long since dulled and diluted by the passage of time and the rigors of age. A meaning eternally tied to youth and innocence and midnight waltzes beneath the stars. A meaning steeped in magic and dreams. Like most Disney classics, 'Cinderella' is one of those rare films that works for all ages, sparking the imagination of the very young, while allowing the old to once again believe. It doesn't quite reach the same heights as the studio's very best efforts, but it gets remarkably close. Exceedingly simple but full of sincerity, heart, and love, the movie has and will continue to remain a timeless treasure. 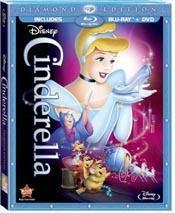 Disney brings 'Cinderella' to Blu-ray as a part of their Diamond Edition series. The release being reviewed here is a Blu-ray/DVD combo pack, but there is a separate three-disc Blu-ray/DVD/Digital Copy release as well. A BD-50 disc and additional DVD copy of the film are housed in a keepcase with a shiny cardboard slipcover (they don't call it a "diamond" edition for nothing). Upon startup, there are some requisite trailers, but Disney mercifully provides the option to skip straight to the main menu. The packaging indicates that the release is Region A, B, and C compatible. The movie is provided with a 1080p/AVC MPEG-4 transfer in the 1.33:1 aspect ratio. Pristine, colorful, and absolutely gorgeous, this video presentation is nothing short of a dream. The source is essentially immaculate, with nary an imperfection in sight. The picture is clean, sharp, and crisp offering a splendid high-def image. Clarity is superb, but the overall animation style is rather simple and doesn't exactly lend itself to loads of fine detail. With that said, backdrops and objects offer a great sense of texture. The color palette provides a pleasing mixture of pastel hues and bright, bold tones, washing the image in vivid radiance. The Evil Stepmother's green eyes glare from the screen with chilling intensity, and Cinderella's moonlit dance with Prince Charming is cast in ethereal blue tints. Contrast is well balanced and black levels remain deep and inky throughout. Thankfully, I did not detect any banding or aliasing whatsoever. Sparkling with magic, 'Cinderella' comes to Blu-ray with a spectacular transfer. Beautifully restored and essentially spotless, the movie looks like it was made yesterday. The film's simple but enchanting style is perfectly preserved and the colors are splendid. The film is presented with a new English DTS-HD MA 7.1 track, and a DTS-HD MA 1.0 rendition of the original theatrical mix. Additional French Dolby Digital 5.1 and Spanish Dolby Digital 5.1 tracks are also included, along with optional English, English SDH, French, and Spanish subtitles. Offering a solid but very subtle expansion, the 7.1 track is pleasing but perhaps a bit too respectful to the original mono mix. Dialogue and vocals are mostly clean, and while there is some inherent thinness to any recording of this age, the mix carries nice fidelity. With that said, I did detect some sporadic peaking in the high frequencies (the scene where Cinderella flees from the ball is a good example). True directionality is rare, and for the most part all effects are pretty front loaded. The film's wonderful music, however, is gently spread around the room, delicately opening up the track's sense of space and atmosphere during songs. Since the movie's original mono track is already included, it would have been nice for this remix to feature a little more activity. Still, it's hard to fault the track for remaining faithful to the movie's original presentation. Both the 7.1 and mono mixes offer a respectful and pleasing audio experience. There are no signs of pops or hissing, and while there is a very faintly strained quality to the track, that's simply the nature of the film's age and original recording methods. The 7.1 mix doesn't really offer the upgrade most might be expecting, but the music's expanded dimension is welcome, giving the movie's timeless songs an extra dash of grandeur. Living up to the Diamond Edition namesake, Disney has packed this release with a plethora of special features, including most of the previous DVD's extras and some brand new supplements. The new bonus material is presented in 1080p, and the old special features are presented in standard definition. All of the extras feature Dolby Digital 2.0 audio and the same subtitle options as the main film (unless noted otherwise). Classic Deleted Scenes (SD, 10 min) - Two deleted scenes and an introduction by Disney producer Don Haun are viewable separately or together. The scenes involve two excised songs, "Cinderella Work Song," and "Dancing on a Cloud." Storyboards are shown as the songs play out, and both of these elaborate sequences look like they would have been quite spectacular if finished. Cinderella Title Song (SD, 2 min) - This is an original demo recording of the film's title song. Unused Songs (SD, 18 min) - Seven unused songs cut from the movie are listenable separately or together. While nice to hear, some of these are in fairly rough shape. Radio Programs (SD, 12 min) - Three vintage radio programs featuring interviews and performances by Ilene Woods (the voice of Cinderella) are listenable separately or together. From Rags to Riches: The Making of Cinderella (SD, 38 min) - Here we get a fairly comprehensive look at the film's production. Details on the movie's development, animation, casting, and music are all provided, offering fans some worthwhile trivia and insights. The Cinderella That Almost Was (SD, 14 min) - Here the focus is on various early drafts and versions of the Cinderella story that Disney considered before settling on the interpretation seen in the film. A lot of these early ideas were quite different from what eventually made it to the screen. At one point, Cinderella was even going to have a pet turtle sidekick named Clarissa. I'm not exactly sure why, but this idea amuses me to no end. From Walt's Table: A Tribute to the Nine Old Men (SD, 22 min) - This featurette focuses on the nine pioneering animators who helped define the Disney style. A roundtable discussion is held with some of today's top animators (including Brad Bird) who all pay tribute to their forefathers." Storyboard-To-Film Comparison: Opening Sequence (SD, 7 min) - A split screen comparison of the opening scene is featured, matching up the finished product to early storyboards and live action references. 1922 Laugh-O-Grams: Cinderella (SD, 7 min) - An early silent cartoon adaptation of 'Cinderella' by Disney is included. Set in the 1920s (when it was made), it's a simple but amusing take on the story. Excerpt from the Mickey Mouse Club (SD, 4 min) - This is a brief excerpt from the Mickey Mouse Club that features actress Helene Stanley who was the model for Cinderella. Theatrical Trailers (SD, 9 min) - The film's original theatrical trailer is included along with several re-release trailers, viewable separately or together. 'Cinderella' is a simple but charming fairy tale classic. While the film doesn't quite reach the masterpiece status that some of the studio's other efforts attain, it's still an exceptional and timeless piece of animated filmmaking. The video transfer is simply a dream, with gorgeous color and clarity. The new 7.1 remix is very solid but doesn't do much to bolster the film's sense of immersion. The disc is absolutely packed with supplements, and all of the bonus features are informative and entertaining, including a surprisingly amusing Second Screen experience. Fully living up to its Diamond Edition status, this is a wonderful release for a wonderful film. Highly Recommended.